The game is live on BT Sport and RedTV International. “We’ve put ourselves in a good position. We have put ourselves into the top four, but you could still say it will be a top of the table clash, which if you look six or seven weeks ago you’d probably have people saying they’d never have seen that coming. “I think the most enjoyable part is we’ve put ourselves right up there and the game will be a massive occasion. There will be a full house at Pittodrie again and it’s games that we all love and enjoy here. “I thought we done well in the cup final and were hoping for a wee bit of luck on the day. I thought it was a very even game and it could have went either way. Since that game we’ve taken the momentum from that with a win at Ibrox. The only blip would be the St Johnstone game, but from that we’ve seen how we can play and built on it by gaining momentum during a very busy period. “Although Celtic may have a few boys out they’ve still got the strength in their squad for it to be a really tough game. We’ve got to be right at the top of our game if we’re to get anything out of it. “It definitely helps being at home and the fans will back us in their numbers again. Since we’ve given them something to cheer about and picked ourselves back up they’ve got right behind the team. They’ll be coming to the game hoping we can go and do the business. If we can give them something to cheer about, they’ll definitely back us. “It’s going to be tough to stay away from overindulging in all the Christmas food! And we need to be as professional as we can be because it’s such a big game on Boxing Day. We’ll enjoy it with the kids and our families, we’ll train on Christmas Day but watch what we eat. We’re in a good position in the league and it feels a lot better, but the hard work is still ahead of us with two games to go. “We want to go into the winter break as high up as we can. “I don’t think we’re trying to make any sort of statement. We’re just trying to get ourselves right back up the league and get as far up as we can. We’re right back in amongst it and we want to continue that as much as we can. It’s just a case of continuing the momentum, trying to get another three points on the board and then we will look to the Livi game after that. Two very tough games but exciting ones. Played 292, won 71, drawn 63, lost 158. Scored 324, conceded 537. Played 145, won 47, drawn 37, lost 61. Scored 188, conceded 219. If you can’t get along to Pittodrie our RedTV coverage will begin at 1.45pm with former Don Stephen Glass joining Dave and Andrew. RedTV International subscribers will be able to watch live and post-match we will have reaction, goal action, highlights and a full match replay and as well as all the post match interviews. Have a great Christmas everyone and we will see you at Pittodrie on Boxing Day for the big one! COYR! Despite clawing Celtic back twice Aberdeen eventually fell to a narrow defeat with Ferguson, May and Cosgrove all finding the back of the net. 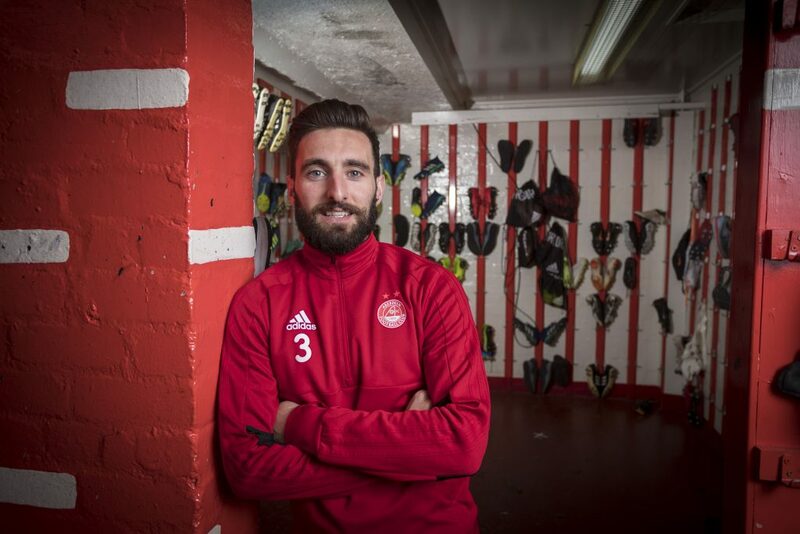 The Dons made one change to the side to face Celtic at Pittodrie with Max Lowe missing out through injury, he was replaced by Dom Ball as Derek McInnes looked set to favour the system which had yielded 12 points from the past 4 matches. The visitors included Ryan Christie in their line-up for the first time in a number of weeks, the playmaker returning to Pittodrie for the first time since his loan spell. After five minutes the visitors took the lead when McGregor found his way in behind the defence after a through ball cut The Dons open. His cross-shot was met by Ball initially, but the rebound fell into the path of Sinclair who had an easy finish from six yards. A disappointing start with Celtic scoring on their first attack. After the early opener Aberdeen tried to apply pressure up the park early on and caught a couple of stray passes from Celtic but were unable to capitalise. Cosgrove was winning his early battles with headers to get McLennan and McGinn into good areas but neither could quite produce the final ball required. Nevertheless, the play offered a lot of encouragement for the home support. The theme continued with Cosgrove leading the line superbly to put the back line under pressure, unfortunately the ball wasn’t breaking kindly for The Dons. However, Aberdeen got a break in the 22nd minute when McGinn was taken down late by Izaguirre in the area after getting his cross away. The referee waited to see the outcome of the cross before pointing to the spot. After scoring from 12 yards last week it was Stevie May who stepped up to knock the ball high into the net. It was what Aberdeen deserved for their application in the early stages of the match. In the 30th minute the visitors had an opportunity when McKenna had a pass intercepted but recovered well to put Christie under pressure to pick up the rebound after a straightforward save for Lewis. The Dons were defending well when they needed to and were applying pressure on the visitors in the right areas to keep things tight at the back. With a bit more luck Aberdeen could have been in front but 1-1 at the break was a fair scoreline based on chances created for both teams. At half-time The Dons made a change with Wright replacing McGinn and Celtic made a change with Hayes replacing Izaguirre who hadn’t enjoyed a great first 45. May was the first player to be booked for a foul on Hayes in the 51st minute. It was Stevie’s fourth or fifth foul of the match and you hoped that it wouldn’t take anything away from his game with 40 minutes to go. The visitors were enjoying their best spell of the game after the break with long periods of possession, but it was Aberdeen who were given a sight of goal when May was brought down 25 yards out. The striker would have been disappointed with his effort, straight into the wall. The Dons were keeping their shape well but the lack of possession was starting to take it’s toll on the legs which was hampering play when they did have the ball. A huge effort was required for the final 30 minutes to keep things tight. When Aberdeen did break through McLennan the winger was unfortunate not to get a foul when he was bundled over by Brown. It was a dangerous position and he looked set to pull the trigger but nothing was given. With 20 minutes remaining Wright got in behind Boyata but his cross was not controlled particularly well and Ferguson was eventually forced to hit a shot on goal with little back-lift. Celtic got the ball cleared and there was a sense that the game was opening up a bit. Up the other end Celtic had a free-kick of their own when Ferguson brought down Sinclair 25 yards from goal. This time Christie got his free-kick over the wall and Lewis had to make a good save to turn the ball behind for a corner. 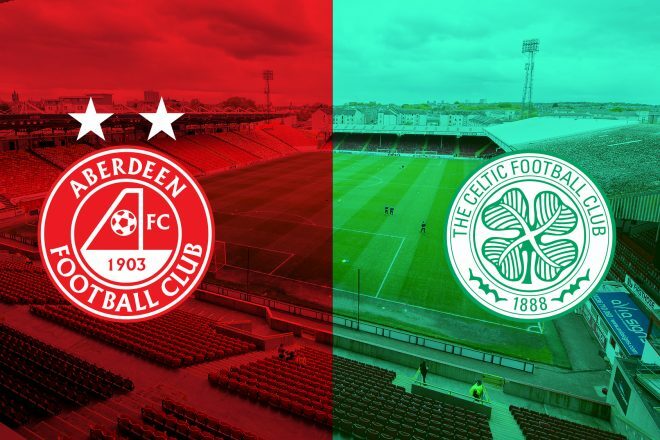 After seeing off the danger The Dons were back under pressure when Edouard found Forrest with a through ball, his cross was low and found Sinclair 6 yards out, the winger made no mistake with the finish to send the visitors 2-1 up in the 77th minute. After the goal May was replaced by Wilson after putting in a great shift once again up front. Despite the setback The Dons fought back admirably and soon had another penalty when Shinnie was bundled over in the area. With May off the pitch penalty duties fell to Sam Cosgrove. The big striker showed great composure to level the score from the spot sending Pittodrie into a chorus of ‘Sammy Cosgrove Ballon D’or’. After a sense of relief began to fill the stadium Celtic struck again to take the lead for a third time. McKenna looked to have halted Edouard with a slide tackle but the ball fell back into the striker’s path and he clipped the ball over the keeper and into the net with 5 minutes of the game remaining. Hopes of a third comeback were dealt a blow when Edouard wandered in from the left to square the ball for Sinclair in the 87th minute, it was the striker’s easiest finish of the day and all too easy. That goal was cancelled out moments later though when Ferguson got on the end of a corner to set up a frantic end to the game. Bizarrely there were only three minutes of stoppage time, would it be enough to level for a fourth time? The Dons had one final chance when a long throw was flicked on at the near post but Wilson’s overhead kick ended up over the bar leaving Aberdeen on the wrong side of a seven goal thriller.